Thanks to all who sent in their photographs for this year’s competition. The winner, Rod Nipper received an Acer palmatum from the Bodiam Nursery’s Plants for Garden Railways stand at the show. Rod also won a Summerlands Chuffer (which he intends to give to John Pearson, owner of the railway on which the photo was taken) and a year’s membership of the Association. Here we present the winning photo and also present two highly commended photos. There were many more however which also captured the marvel of a garden railway within lovely planting and I hope to present these later along with more photos along with plant names to help in your planting plans. Dave Kaye. A superbly built railway with real thought given to the planting and the construction. The photo composition very attractive scene was well thought out with the steam making it very dynamic. This is a very attractive scene with beautiful planting. The varied colours, shape and size make the carefully pruned shrubs resemble miniature versions of full-scale plants. The pond provides further interest with in-scale planting. A well- deserved winning entry. Rod submitted the photo along with a description of the scene at John Pearson’s garden which he photographed on a day when the garden was open to the public. Hence the visible sign which warns visitors not to walk on the railway. A wonderful composition with the low camera angle and the steam plume adding real drama. This photograph demonstrates the importance of having a good backdrop to create a realistic scene. The yew hedge is varied in colour and texture and shows off the paler greens of the planting in front of it. 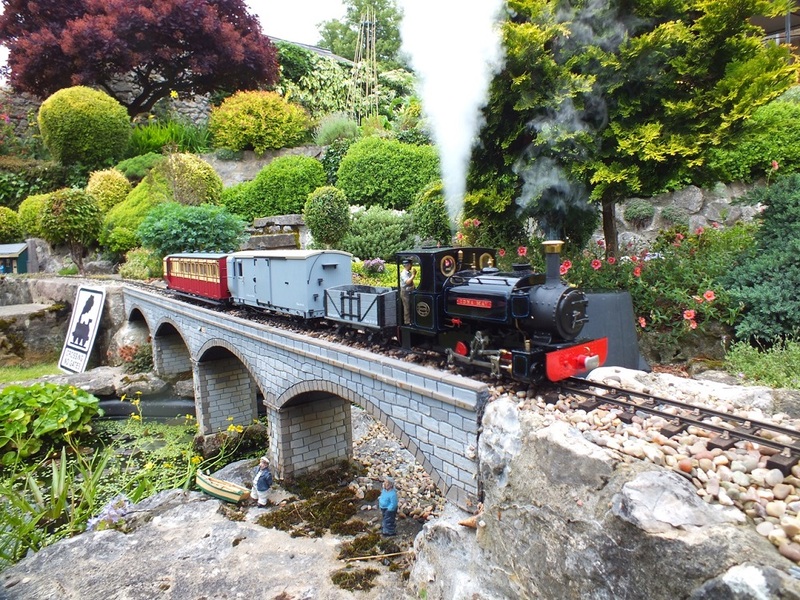 A range of colour and shape is provided entirely with greens and show that flowering plants are not essential to create an attractive garden railway. 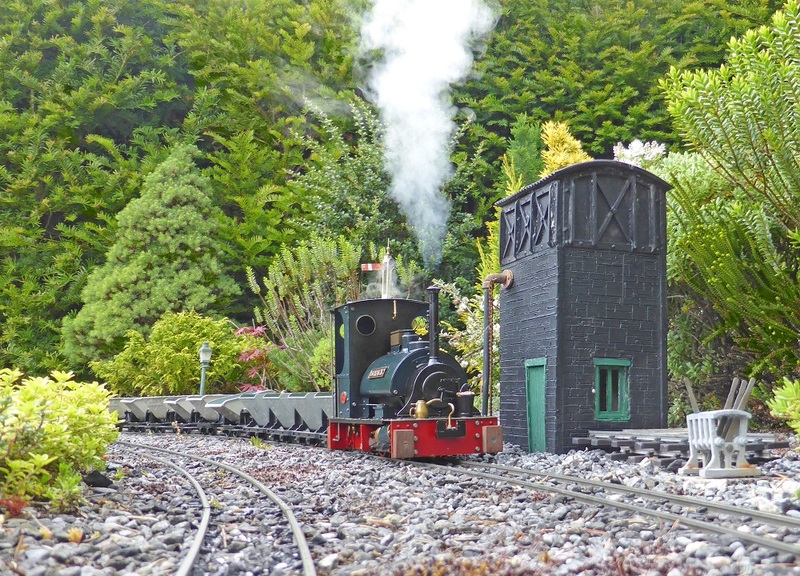 The Harvey Watkins Pot boiler Peckett locomotive is shown taking water at Bron Y Aur on the Vale of Evermore Railway. This photo achieved a high degree of realism (other than the Native American on the hill perhaps!). The composition is simple and effective. 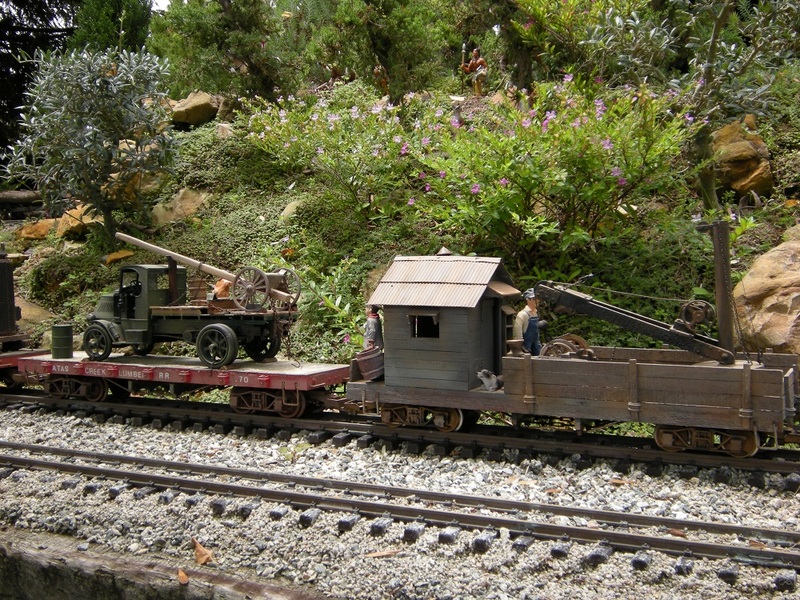 A very realistic backdrop, with a scale figure establishing the location of the scene. Excellent ground cover and varied shrubs are perfectly in scale, adding touches of colour to the otherwise subdued naturalistic colouring in the picture.